The Euphorbiaceae is a very large, widely distributed family including around 300 genera and 7700 species, mainly non-succulent herbs, shrubs and trees found in temperate, sub-tropical and tropical climates. The spurge family takes its name from the genus Euphorbia that includes many choice succulent plants of interest to the collector. 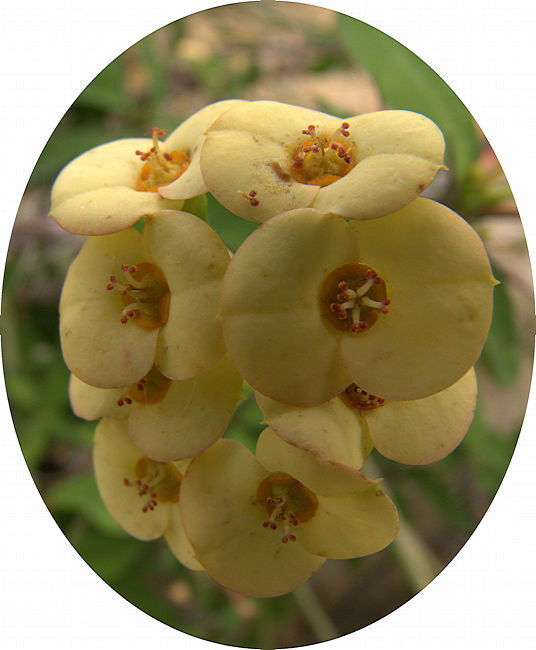 The Euphorbiaceae have very distinctive small cup-shaped compound flowers. The flower is technically known as a cyathium, consisting of a cup-like involucre containing a single pistil (female flower) surrounded by male flowers, each contributing a single stamen. The cyathium may be surrounded by brightly coloured bracts that give the appearance of a large flower. 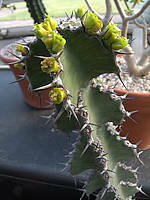 However, some species of Euphorbia have separate male and female plants and some species e.g. 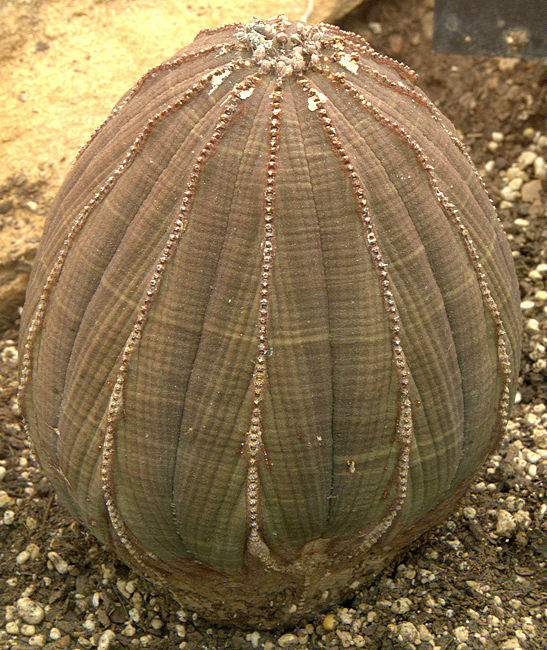 Euphorbia obesa may produce a mixture of male, female and bisexual flowers. The milky sap of many species contains latex. Euphorbia latex is commercially exploited, with Hevea brasiliensis (rubber tree) the main species grown in plantations throughout the tropics, especially Malaysia and SE Asia. 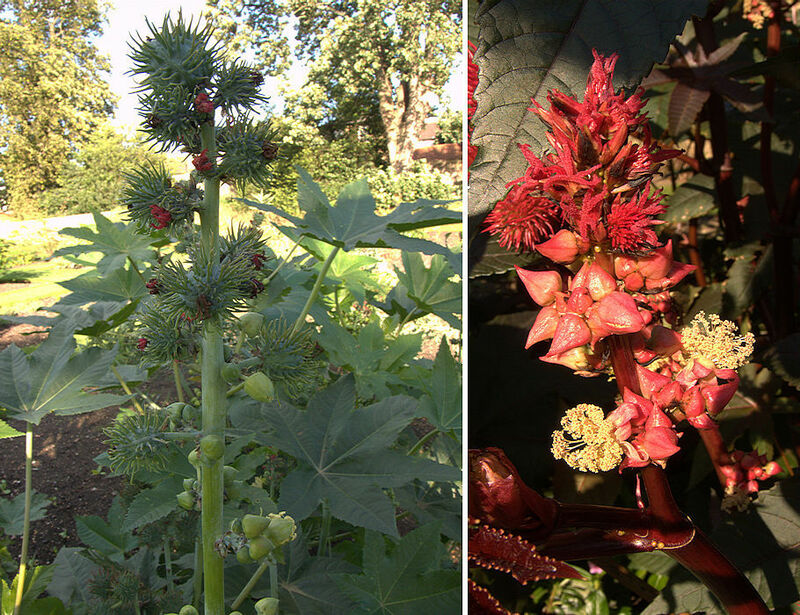 Other important Euphorbiaceae include Ricinus communis (Castor Oil Plant), Manihot esculenta (Cassava) cultivated for its starchy root and Euphorbia pulcherrima (Poinsettia). 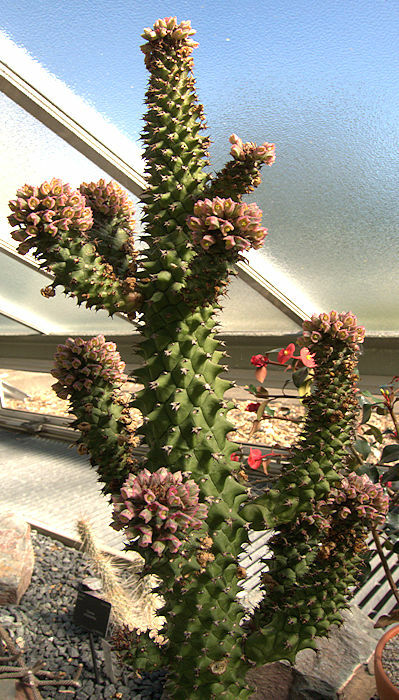 The genus Euphorbia includes around 2000 species. 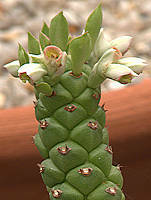 The 850 succulent species are mainly native to Africa and Madagascar with a few in India and other hot countries. 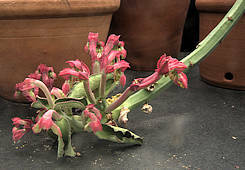 The obsolete genera Endadenium, Monadenium, Pedilanthus from tropical America, Phyllanthus, and Synadenium have been merged into Euphorbia, but will be encountered often in old books and on plant labels. 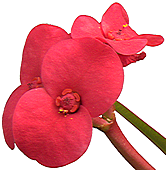 Monadenium, and Pedilanthus are grouped separately below as their distinctive morphology makes a useful division. The genus Euphorbia include diverse lifestyles including caudiciforms, stem succulents, shrubs and trees and some excellent frost-hardy non-succulent garden plants. 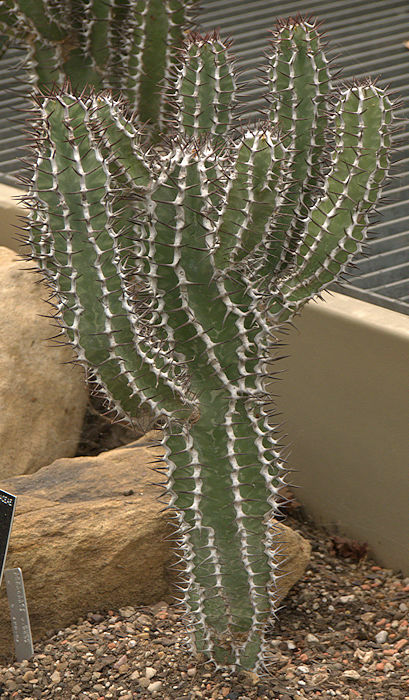 Some of the succulent species are very spiny, resembling Cactaceae at a first glance. 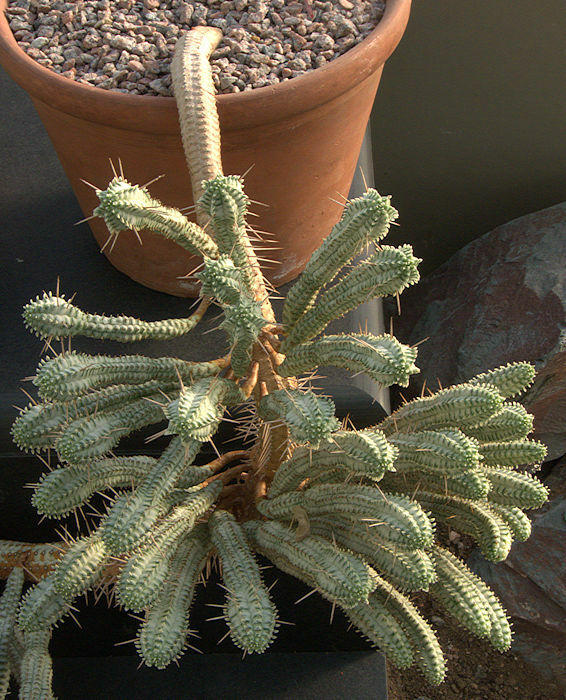 However, Euphorbia spines are in pairs compared to the distinctive areoles bearing spine clusters on Cactaceae. Fruits are three-lobed and dehiscent, sometimes splitting apart explosively to distribute the seeds. 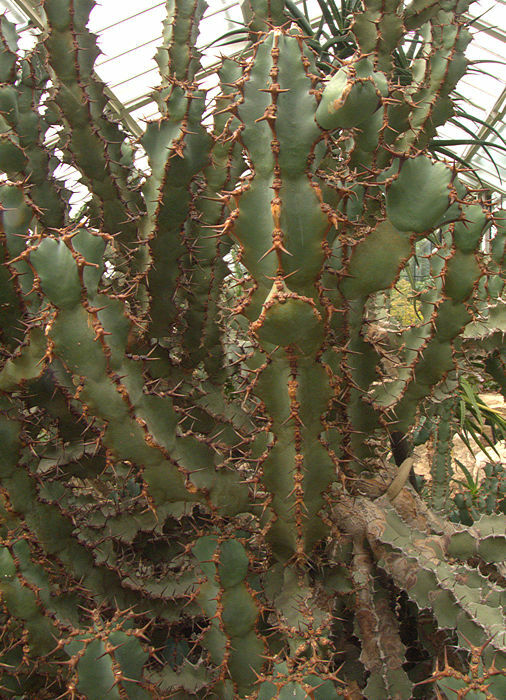 Many Euphorbias have a milky sap that contains latex and irritating toxins including diterpene esters, alkaloids, glycosides, and ricin-type protein toxins, depending on the species. The sap should be washed off the skin without delay and eye contamination avoided at all costs. When taking cuttings latex can be stopped from bleeding by dipping the cut surface in water which coagulates the latex. Some succulent Euphorbias bleed latex easily and it is advisable to spray plants with water from a hand sprayer after moving them to stop this. 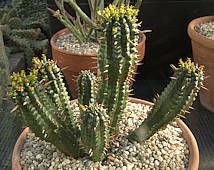 Cultivation: Most succulent Euphorbias require warmth and full to partial sun. Watering should be very sparing during the winter, especially for caudiciform species unless they can be kept warm and in growth. A very gritty compost suits most species, especially caudiciforms and those with fleshy roots. 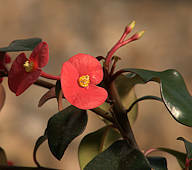 However, succulent Euphorbias, especially those with leaves, appreciate a dose of high nitrogen fertiliser at the start of their growing season. At other times a balanced fertiliser is suitable. 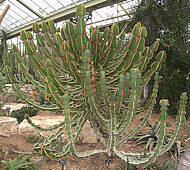 This candelabra-like succulent tree grows up to 30ft tall with the main stem supporting several upright branches, which become corky with age. 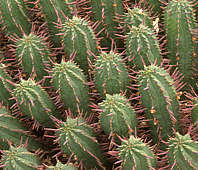 Younger stems have a dark green colour and 4 - 8 deep angles with pairs of spines along their somewhat undulate edges. Ephemeral leaves and yellowish-green cyathia are produced along the angle edges near the growing tips. The oval fruits are red and fleshy, up to an inch long. Native to Eritrea, Northern Ethiopia, Somalia and Sudan, growing on stony soils at elevations of up to 4800ft. The toxic sap is used to cauterise ulcers and as a purgative. The tree is a source of wood for making charcoal. Photographed in the University of Oxford's Botanic Garden. 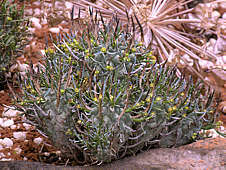 This succulent sub-shrub has four-angled blue-grey branching stems with pairs of reddish thorns arising from large thorn pads along the stem edges. 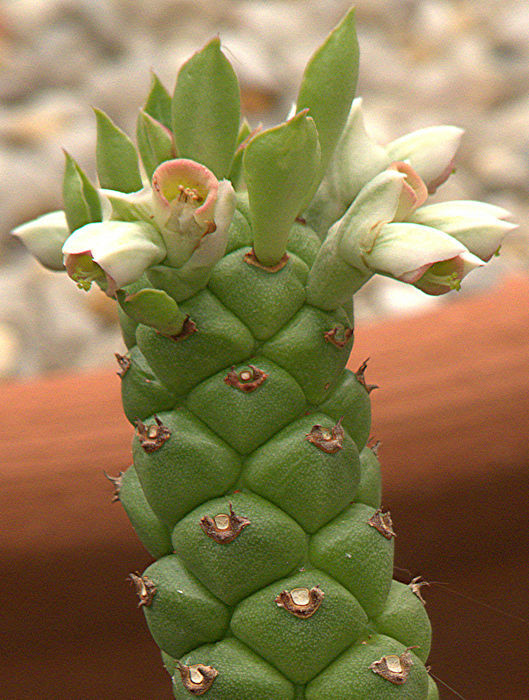 Plants grown from seed have a subterranean caudex. Bright yellow flowers are produced along the stem edges in Winter. growing at the Langtry visitor center, Texas. 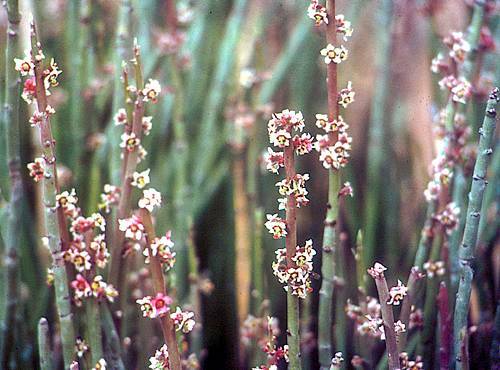 The epiphet antisyphylitica refers to this succulent plant's supposed medicinal properties. 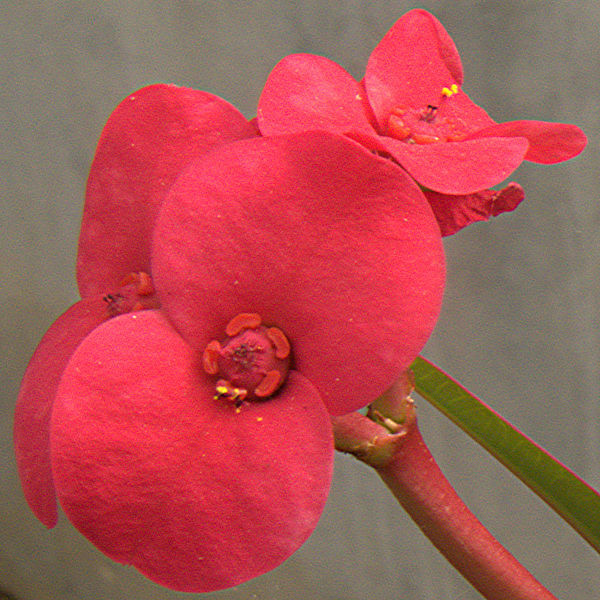 The flowers are relatively decorative by the standard of many Euphorbias. 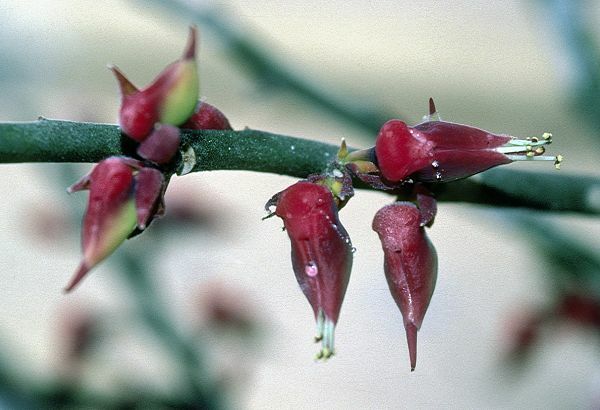 This plant is relatively common in the Big Bend country and the Rio Grande valley but in its natural habitat, where water may be scarce and the heat intense, the stems often have a bronzed appearance. The candelilla plant was an important source of candelilla wax, which is still produced in small quantities by boiling large quantities of the stems with sulphuric acid, and skimming the wax from the surface of the vat. The wax was used in the manufacture of phonograph records, in cosmetics and as an industrial lubricant. Unfortunately, much of the plant material required for processing is harvested from its native habitat putting pressure on plant populations. This species is a compact succulent shrub up to 4 ft tall, spreading with many branches from the base. The 4- 6 angled winged stems have regular constrictions every couple of inches. The edges of the stems are undulate with regular pairs of robust spines whose shields touch to form a continuous horny margin. Yellow flowers are produced near the ends of the stems in late Summer. Native to arid South-facing limestone slopes in Somalia at elevations 4400 to 6500 ft above sea level. 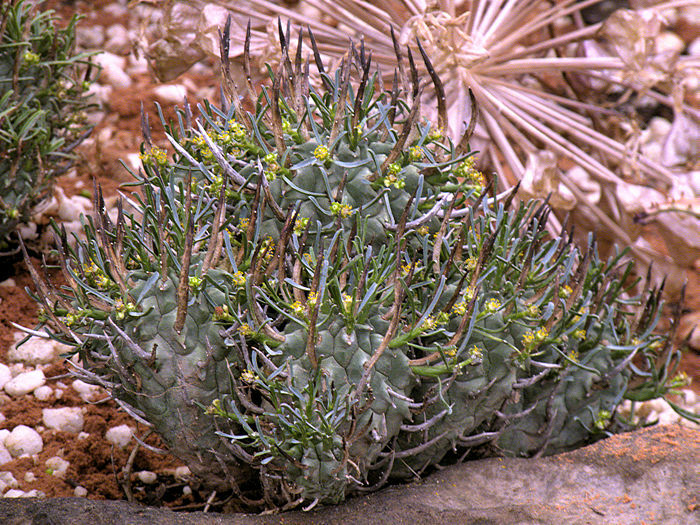 This succulent shrub is found in the Canary Islands, West Africa, Somalia, Sudan and the Arabian peninsula. The smooth trunk branches freely. The stems carries a rosette of narrow lanceolate leaves at their ends, and bleed white, sticky latex when disturbed. Thinner stems tend to self prune in adverse conditions. 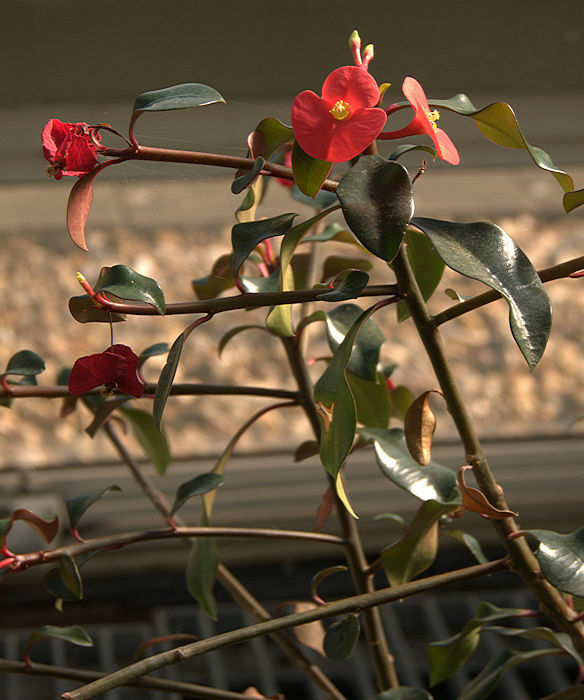 The plant tolerates cool, frost free winter conditions and can be put outside during the Summer. Photographed in the POW Conservatory, RBG Kew. 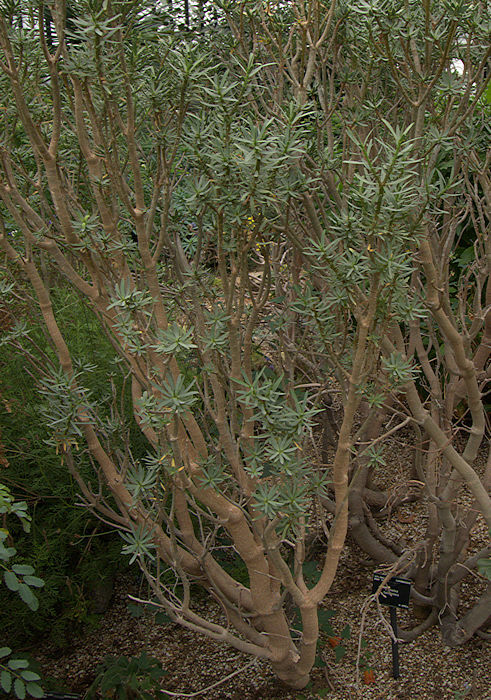 This sprawling succulent shrub produces thick, branching stems up to 2 ft tall with several narrow constrictions between wider segments. 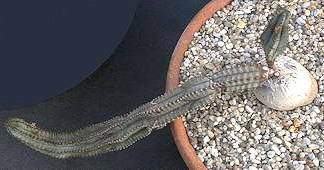 The surface of the stems is marbled in light and dark green and the undulate margins are furnished with well-spaced pairs of spines. The plant is often grown as a caudiciform with its tuberous root exposed. 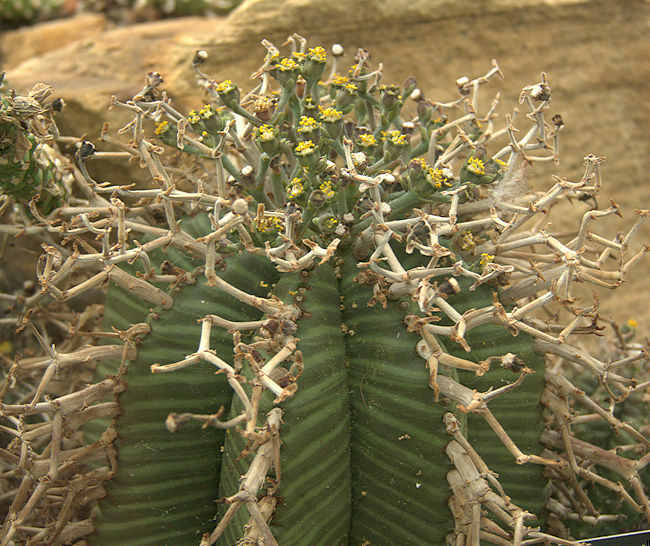 A columnar, branching Euphorbia with 4-6 angled blue-green stems furnished with pairs of brown thorns along the vertices. Clusters of small yellow flowers on the stem vertices around the growing point are followed by pink berries. 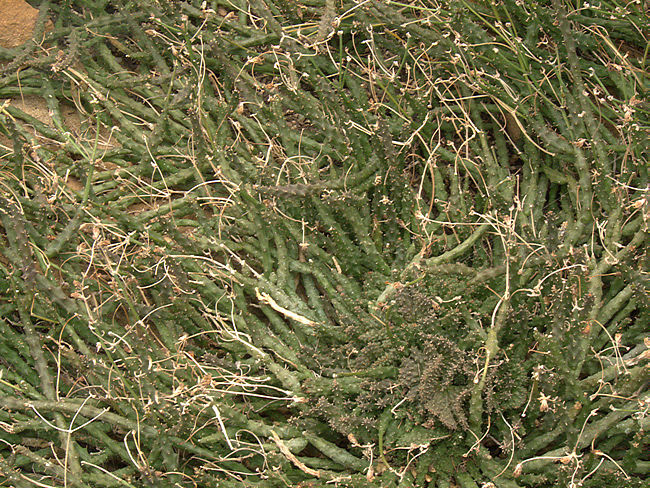 These succulent bushes grow 5 - 10 ft tall and spread by stolons. Although the milky latex is poisonous, dry stems can be used as fodder. Native to the Noorsveld area of Cape Province, South Africa. 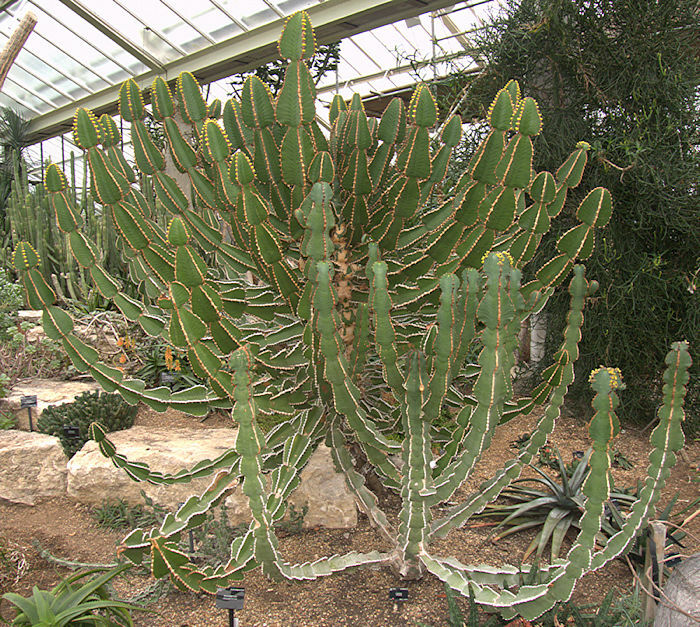 This columnar, branching Euphorbia has succulent 4 - 5 angled stems, capable of growing into a 12ft tree. 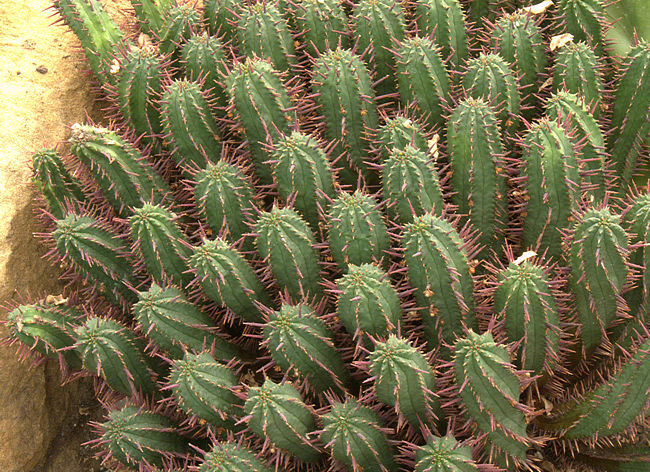 The undulate edges of the stems are furnished with pairs of small spines. Clusters of ephemeral leaves and reddish-green flowers are produced near to the ends of the stems. Native to low-lying parts of the Canary Islands up to 3500 ft and commonly sold as an undemanding houseplant. Often used as grafting stock for species that struggle on their own roots in a cool climate and to bulk up cuttings of choice species for sale. The latex is toxic, but less so than that of many other Euphorbias. A short caudiciform stem up to 6 in in diameter supports a head of tuberculate stems with vestigal leaves at their actively growing ends and white flowers in the Spring. 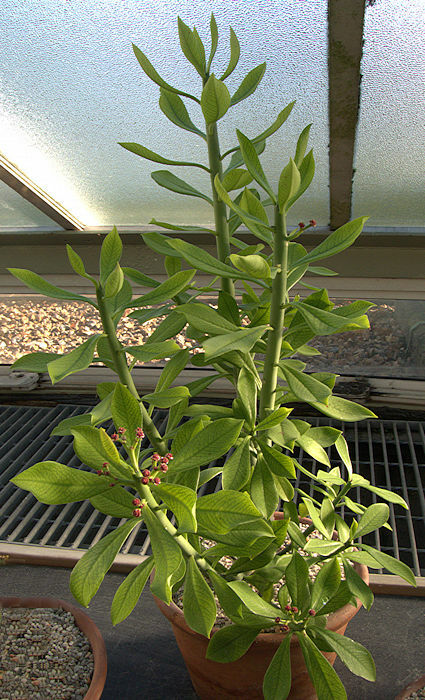 Stoloniferous stems may arise from the base of mature plants and develop heads of their own. The main stem has a tap root. Native to the Western Cape of South Africa. 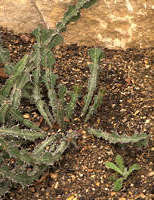 Cuttings of side stems can be taken but may be slow to develop the normal caudiciform habit. 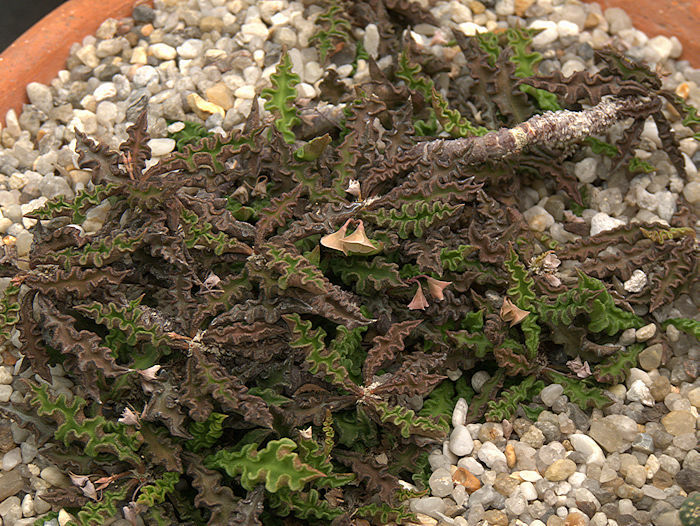 a small caudiciform Euphorbia popular with growers of alpines. Native to mountains of Botswana and South Africa where it grows at elevations of 4800-8800 ft. In the very strong light of its habitat, the arms are short and compact forming a hemispherical cushion with small yellow-green flowers. This succulent plant tolerates cool, frost free winter conditions. The sap may irritate the skin. Photographed in the Alpine House at RBG Kew. Named for: Raymond Decary (1891 - 1973) French botanist. This variable species is a small leafy mat-forming succulent plant, spreading by means of rhyzomes. The angled stems are spiralled and somewhat spiny . The thickened dark-green to brownish-purple leaves have undulate margins, forming rosettes around the growing tips of the prostrate stems. 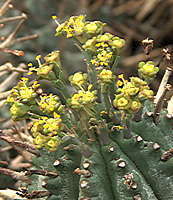 The small flowers have beige, yellowish or pinkish cyathia. Native to Madagascar. Needs constant warmth. Named for Cape Sainte Marie at the Southern end of Madagascar. 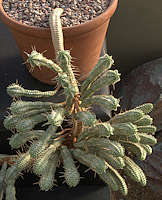 This choice succulent Euphorbia has a subterranean caudex up to 2 in diameter from which arise cylindrical silvery branches patterned with leaf scars and tipped with a rosette of brownish-green lanceolate leaves with undulate margins. Greenish brown cymes are produced near the ends of branches. Native to Madagascar. 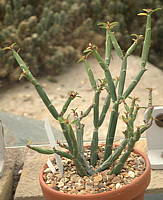 Cuttings of branches are possible but may not form a caudex. Named for: Mr. Robert Desmond Meikle (b. 1923) Northern Irish botanist from Royal Botanic Gardens, Kew. A branching tree growing up to 18ft tall. 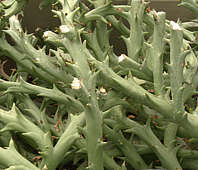 Younger stems are 4 - 7 sided and heavily armoured with pairs of white thorns along each edge. Relatively large persistent cordate dark-green leaves with reddish margins cluster near to the growing stem ends and may adopt a reddish tinge in full sun. The branching inflorescence produces greenish-yellow flowers. Native to tropical West Africa including Cameroon and Nigeria. 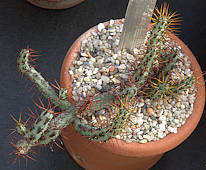 Left: Euphorbia enopla Boissier 1860 from the Eastern Cape forms 3ft tall clumps of 6-7 angled or ribbed branching, fat, succulent stems with red spines along the apex of the ribs. Spines are old flower peduncles. Small vestigial leaves are produced near the growing points. Euphorbia ferox Marloth 1913 is similar to Euphorbia enopla but with fatter stems. 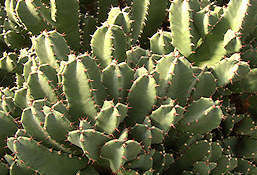 Euphorbia heptagona Linnaeus 1753 from the Western Cape forms succulent bushes of tall 10ft, branching 7-11 angled or ribbed stems with green, brown or grey spines along the ribs. Euphorbia esculenta Marloth 1909 (Vingerpol) - one of the "caput-medusa" Euphorbias. A substantial central caudex up to 8 in diameter is surrounded by many fleshy arms patterned with shallow tubercles. Flowers around the growing points are fluffy white tufts with yellow stamens and surrounded by small brown bracts. 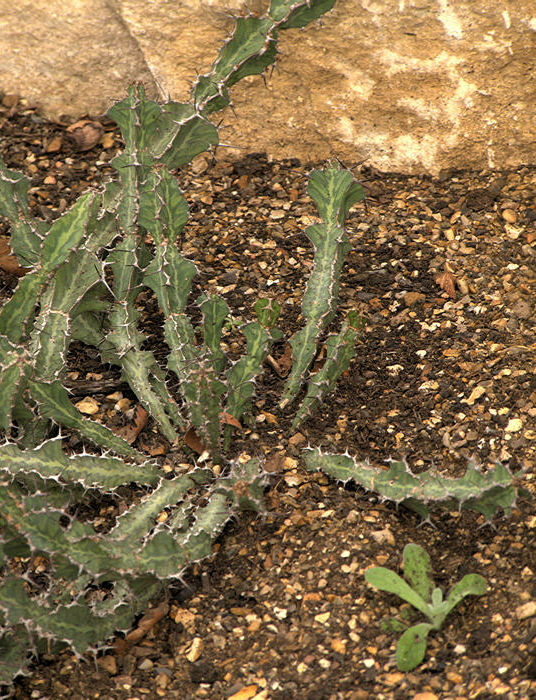 Although the epithet "esculenta" means "edible" this succulent plant should be regarded as poisonous. However it is used as cattle fodder. Native to the South-Eastern Cape Province, South Africa. 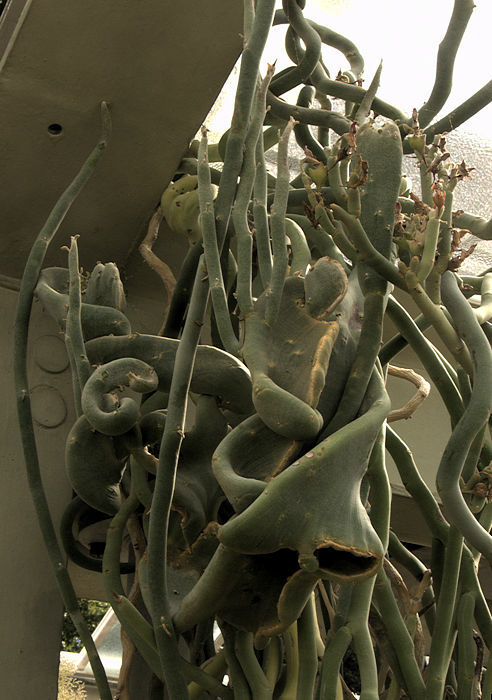 This succulent plant produces a single multi-angled stem branching towards its end. 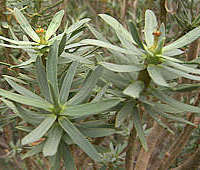 Younger stems are greyish-green and furnished with clustered spiny tubercles. Tiny ephemeral leaves and yellowish flowers are produced at the ends of the stems. A columnar, branching Euphorbia with succulent blue-green stems to 20 ft tall. Native to Zambia and Zimbabwe, along gorges of the River Zambezi below Victoria Falls. Named for: Raymond Gerold (1928 - 2009) French plant collector and trader. 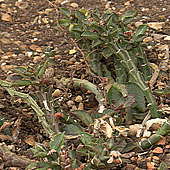 This succulent shrub has opposite pairs of oval glossy dark-green leaves with pale green lower surfaces along branching cylindrical stems without spines. The showy red cyathophylles are produced throughout the year. Native to a very limited area of tropical rain forest of North-Eastern Madagascar, growing at low elevations on sandy soil. Requires a warm, dryish Winter. A shrubby, branching succulent Euphorbia with angular green stems to 6 ft tall furnished with strong, branching spines reminiscent of cow's horns. Vestigal leaf scales are produced between the spines. Small groups of tiny yellow flowers appear in late Spring near the growing points and along the leaf margins, followed by 3-lobed purple capsules. Native to low altitude grasslands of KwaZulu-Natal, Swaziland, Kenya and Mozambique. Grows naturally in huge clumps and is used as a barrier plant. In cultivation this plant needs plenty of sun to keep it compact and generate strong spination. 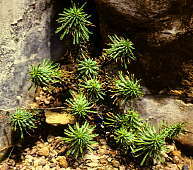 Sprawling succulent shrubs with thin (half-inch), branching, 4-6 angled spiny stems about 3ft tall. Tiny yellow flowers are produced near the ends of the stems. Native to Northern South Africa, Southern Zimbawe, Mozambique and Botswana. 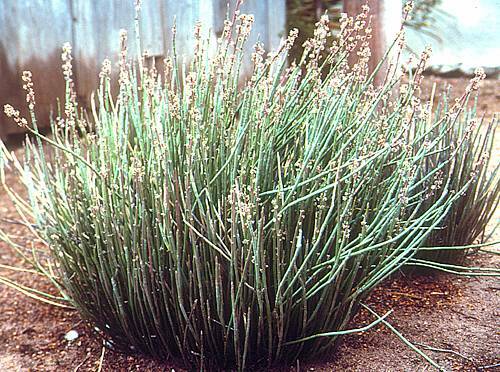 This shrubby plant has frequently-branching smooth cylindrical green stems growing to a height of 5 ft and forming large clumps. Stems bear scars from minute vestigial leaves with three slightly-raised longitudinal lines below each one. In the Spring, bright yellow flowers with a disagreeable odour are produced at stem tips, followed by bright pink capsules. Native to Namibia and the Northern Cape of South Africa. 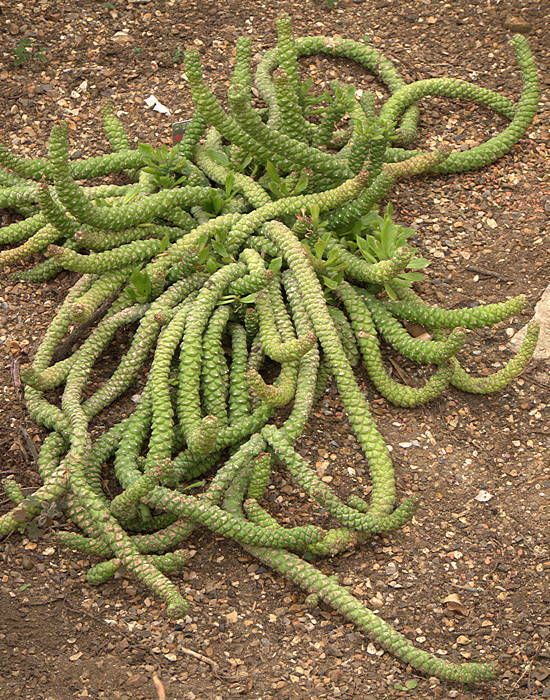 Shrubby succulent plants with a tuberous root. 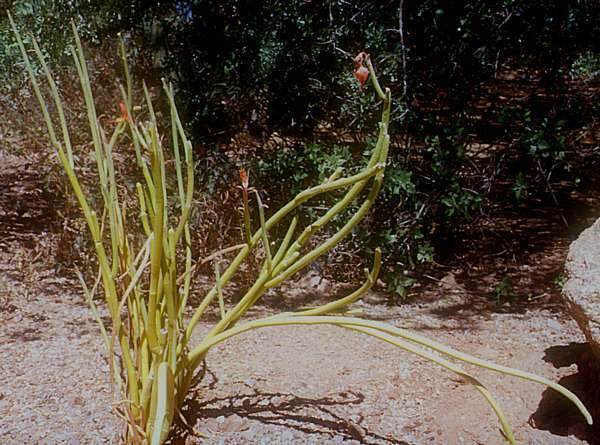 The thick fleshy, tuberculate stems are spineless and produce vestigial leaves and small green to reddish flowers at the growing points. Native to Namibia and the Northern Cape. Reported to be cold tolerant. from the Wittepoort Mountains of the Great Karoo. 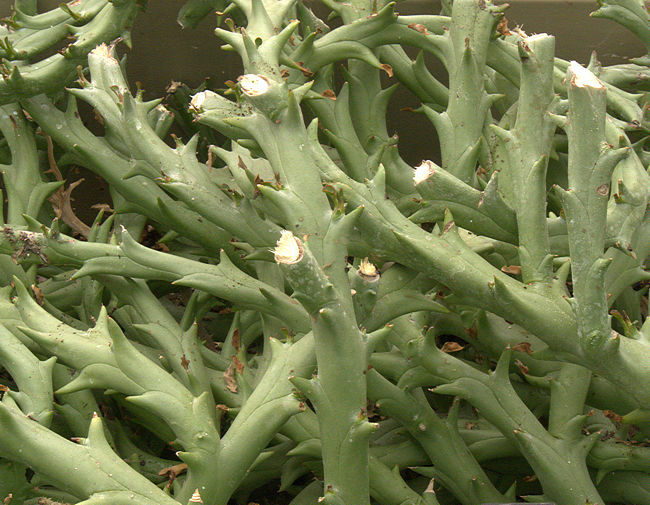 This spiny clumping succulent plant has angular stems up to 18 in tall and with up to 20 ribs. 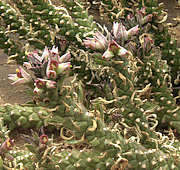 This species is somewhat variable and selected cultivars are known with dark-green to glaucous-grey plant bodies, different degrees of spination or with red spines and flowers. 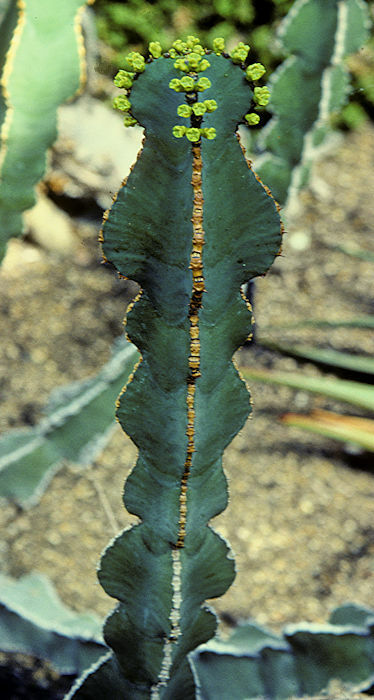 The long peduncles (stalks) of the small male and female yellow-green flowers produced on the ribs near the growing point, desiccate to become prominent rows of rigid spines up to 2 in long. The white sap is very poisonous. 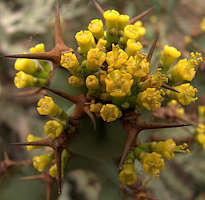 The habitat of Euphorbia horrida receives both winter and summer rainfall. However it is advisable to withdraw water from cultivated plants during cold weather. The plants tolerate a touch of light frost if bone-dry. Strong light is necessary to prevent the stems from becoming unnaturally elongated. 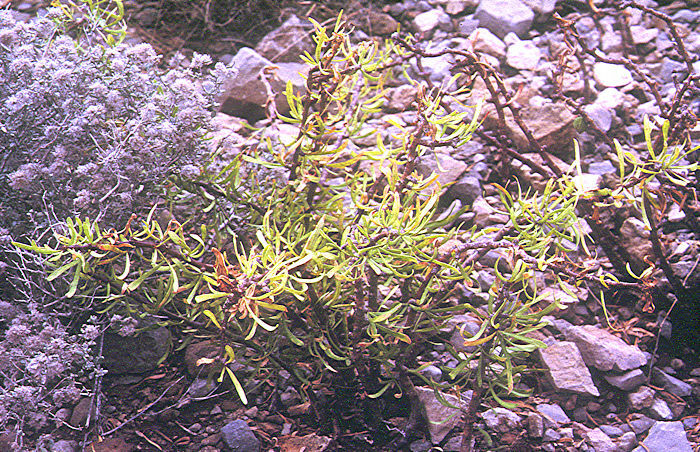 This Euphorbia is a host for the parasitic mistletoe Viscum minimum. A small caudiciform stem supports upright, but decumbent with age, purple-green 5-angled stems which may branch and whose ends bear deciduous vestigal leaves and solitary yellowish flowers. The plant spreads via long, thin rhyzomes. Native to the Eastern Cape Province of South Africa. 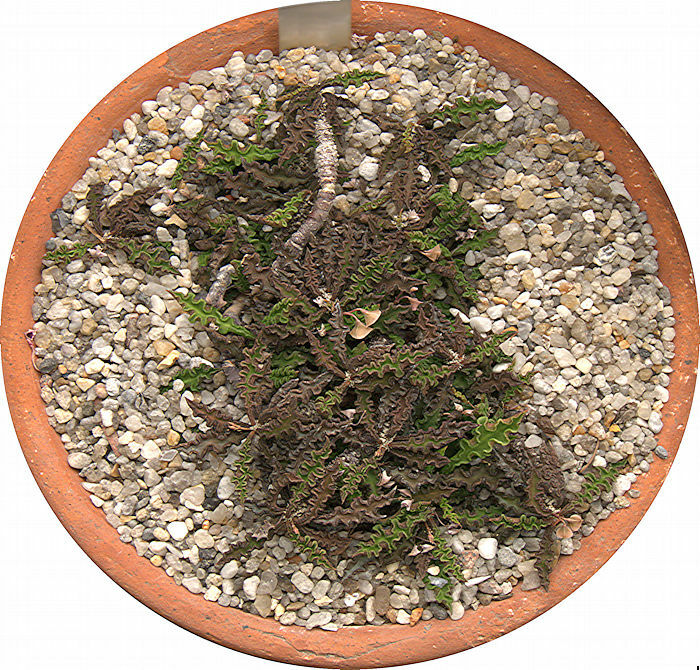 Seed-grown plants form a caudex but cuttings may not do so. 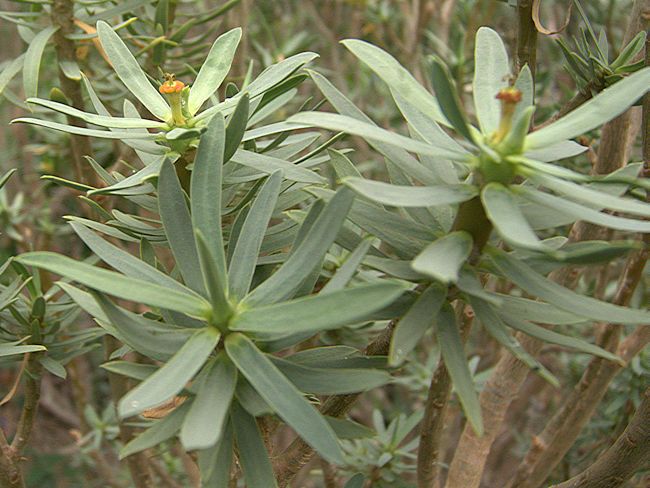 This low-growing shrublet has fleshy, succulent green to greenish-white stems that branch to make a clump. Stems have 7 - 17 ribs of confluent tubercles with tiny ephemeral leaves and occasional spines that are persistent sterile peduncles. Native to the South African Little Karoo and Cape Province. 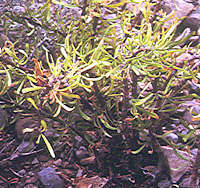 This freely-branching succulent shrub is quite variable, with at least six forms recognised. The round stems, patterned with leaf scars, produce deciduous, lanceolate leaves near their ends. Umbels of yellow cyathia are produced around the ends of the stems. Native to Namibia and the South African Cape. Spheroidal succulent plant bodies with prominent ribs or angles, attractively striped in shades or green and with prominent branched peduncles (old flower stems) along the vertices. The plants may become columnar or clump with age. 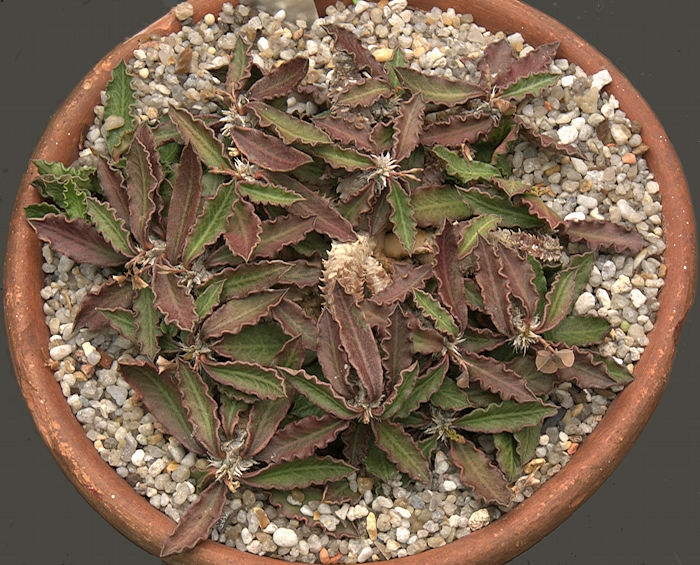 The peduncles of Euphorbia meloformis ssp. valida are more persistent than for E. meloformis. Plants generally produce either male or female flowers. 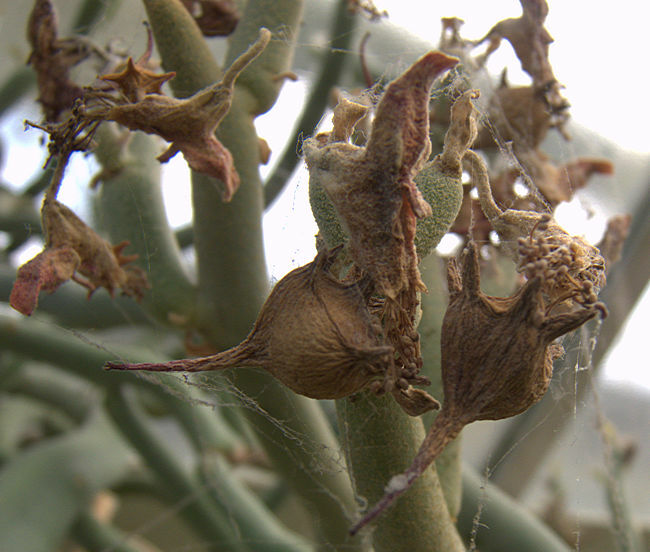 As with many Euphorbias the dry seed capsules are explosively dehiscent as a mechanism for scattering the seed. 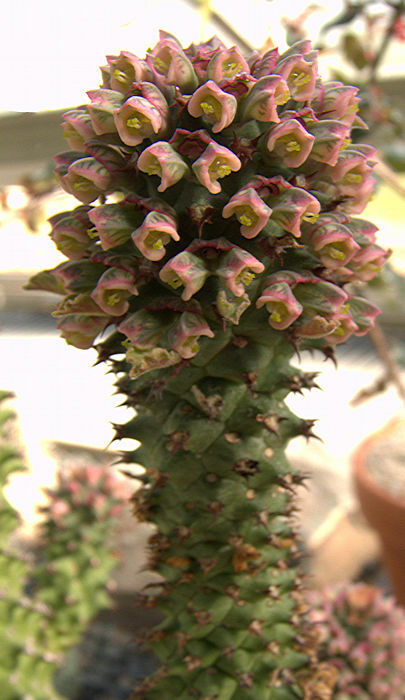 This slow-growing succulent plant is native to the Cape Province of South Africa. Best in full sun to light shade. It tolerates a cool, dry winter when it is dormant. from Madagascar but spread across the Middle East in ancient times. 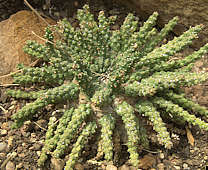 This spiny, woody but succulent shrub produces small oval green non-succulent leaves, mainly near the ends of the stems and falling off older growth or when environmental conditions are unsuitable. The small flowers produced throughout the year, are surrounded by a pair of bright red bracts. Numerous selected forms are available with pink, yellow or even white bracts. Several hybrids have been made with other species, especially E. lophogona. Vast numbers of plants are produced in the horticultural trade from cuttings, especially for Christmas. 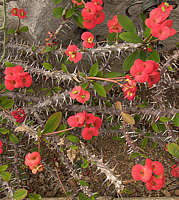 In tropical climates Euphorbia milii is used to make an impenetrable flowering hedge. This plant is not frost tolerant and in my experience dislikes being below 40°F. 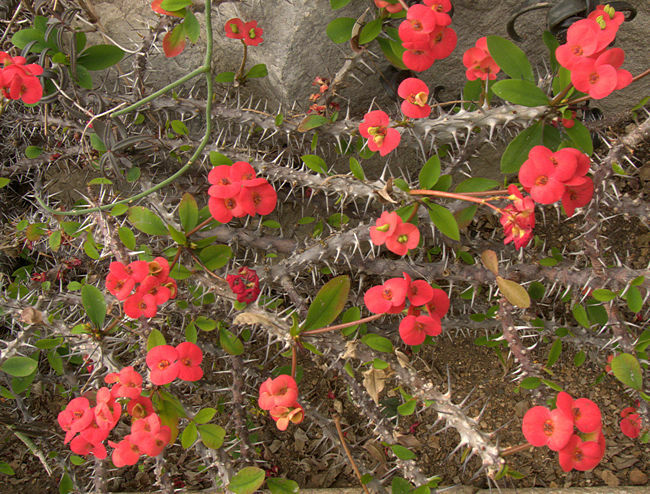 Legend has it that a wreath of Euphorbia milii was the Crown of Thorns worn by Christ at the crucifixion. 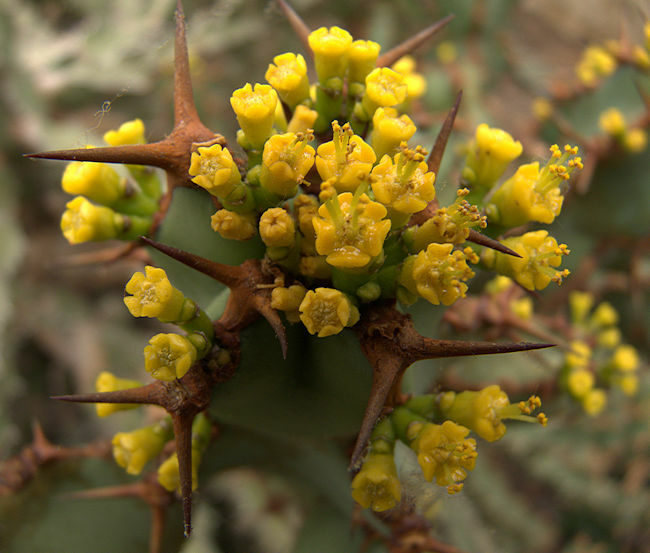 However, an alternative candidate native to Palestine is the non-succulent woody shrub Paliurus spina-christi "Christ's Thorn". 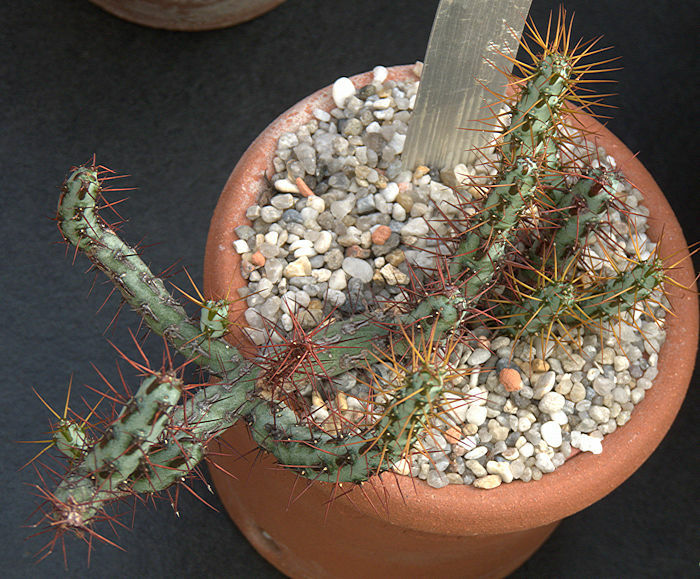 Left: Euphorbia milii var. splendens (Crown of Thorns) - a more robust form of this classic spurge, with larger flowers a thicker stem and shorter, triangular thorns. 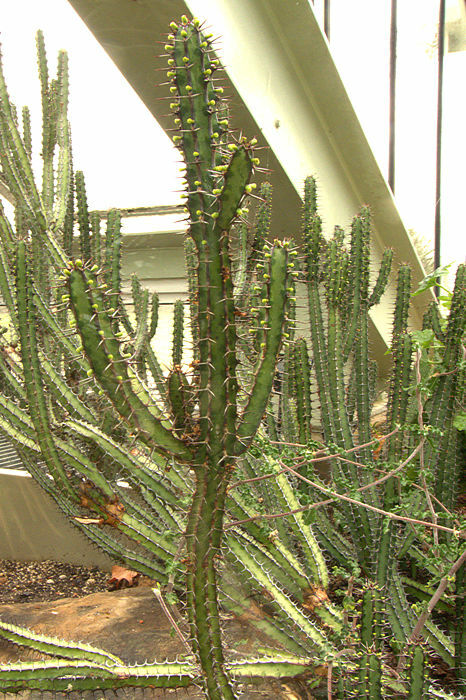 Right: Euphorbia milii var. imperatae a form with yellow flowers, tending to fade to a slightly pink tint. A variable plant with a main stem branching at its apex with 5-6 to 14-sided stems carrying solitary spines or spineless. The root is tuberous and in habitat the main stem is mostly underground. Native to the Western Cape of South Africa. Usually seen under the synonym. 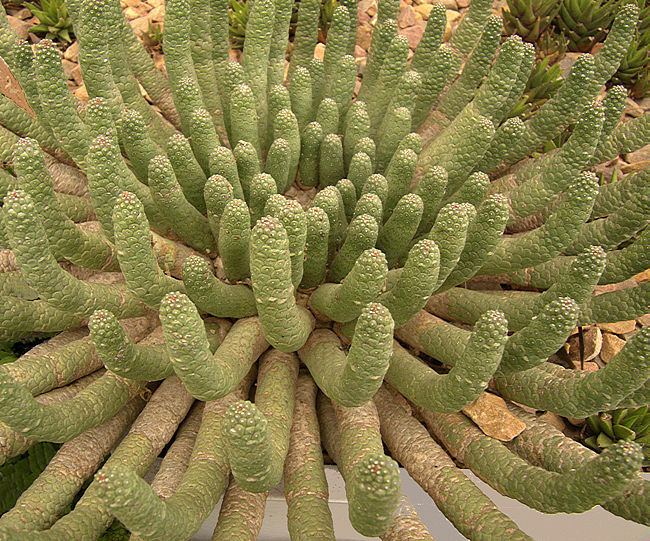 a rare globose succulent plant becoming columnar with age, from the Karoo in the Eastern Cape of South Africa. The typically 8-angled single stem is easily grown to about the size of a cricket ball and will grow much larger to a 10 in column, rarely offsetting. It is challenging to keep mature plants from becoming corky around the base or from collapsing during the winter. In a strong light the plant body, usually gray-green with purple banding, becomes bronzed. Tiny yellow flowers are produced freely near the growing point. Some plants produce only male or female flowers; others produce both. The flowers are followed by explosive, angular seed capsules which must be covered with fine mesh before they ripen if the seed is to be collected. 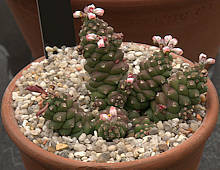 Euphorbia obesa is a favourite with succulent-plant enthusiasts and although rare in its habitat, is common in collections. 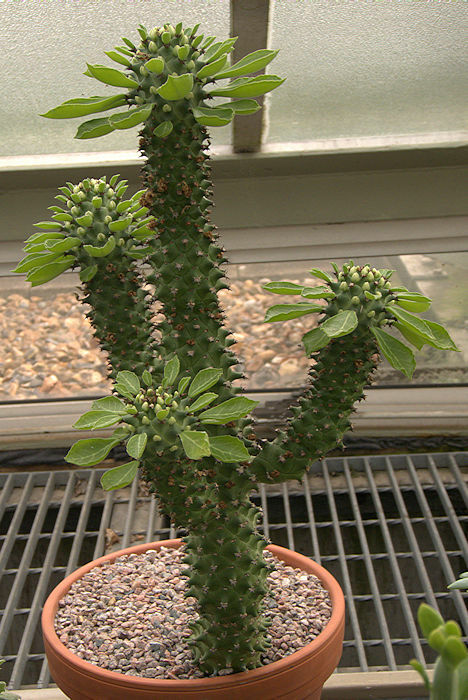 However, as it hybridises freely with other Euphorbias many cultivated specimens may not be pure bred and this may explain many oddities and divergence from normal growth patterns such as offsetting. 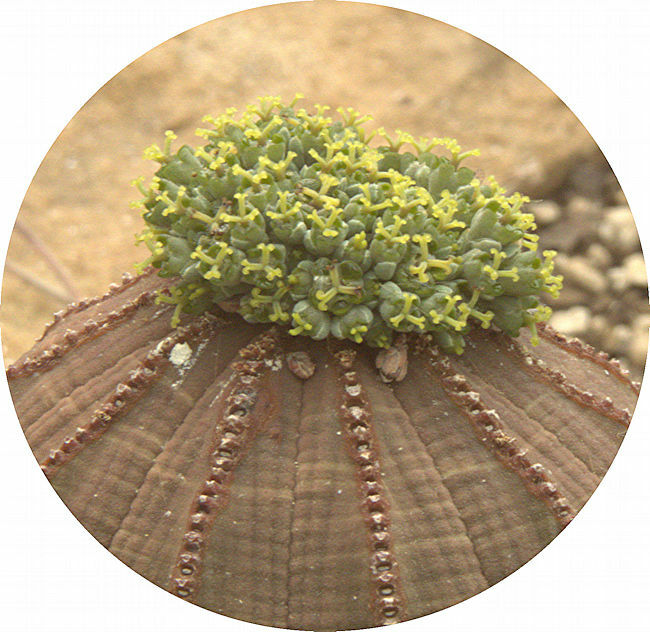 The smaller globose species E. symmetrica has been reduced to sub-species status: E. obesa ssp. symmetrica. Name: refers to phosphorescent light allegedly emitted from heated milky sap. 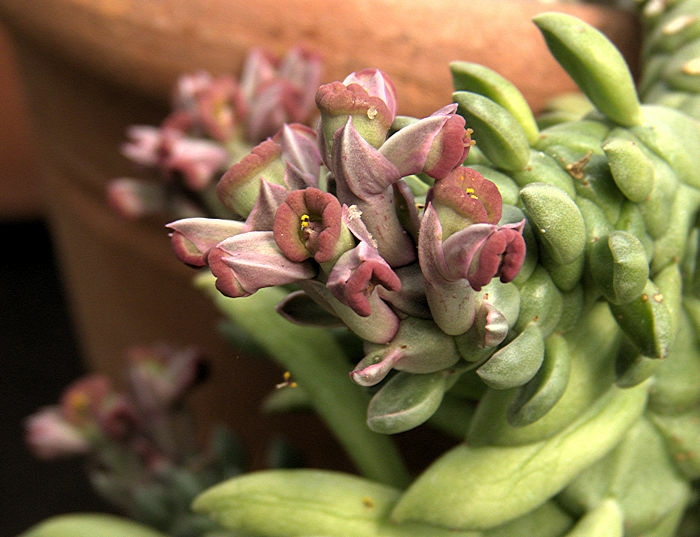 This succulent shrub has narrow ribbed stems with small ephemeral ovate leaves. The stems branch a few inches above the ground to form a dense clump of stems up to 20ft tall. Small yellow to red flowers with red centres are produced from leaf axils along the stems and at their tips. 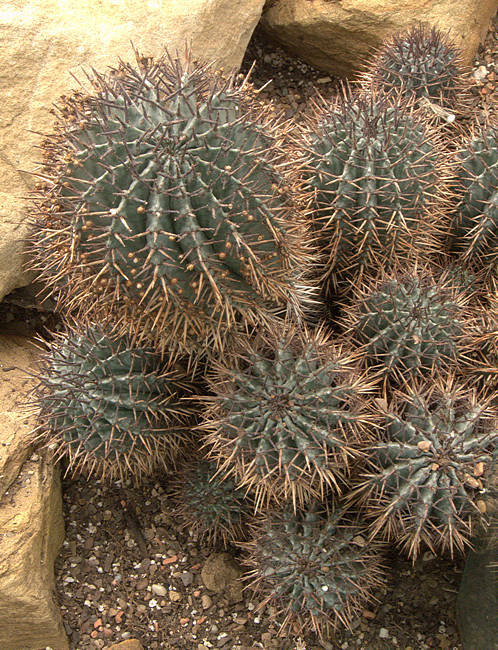 Native to the Bahia and Paraíba states of Brazil growing on dry rocky hills and plains among xerophytic scrub. 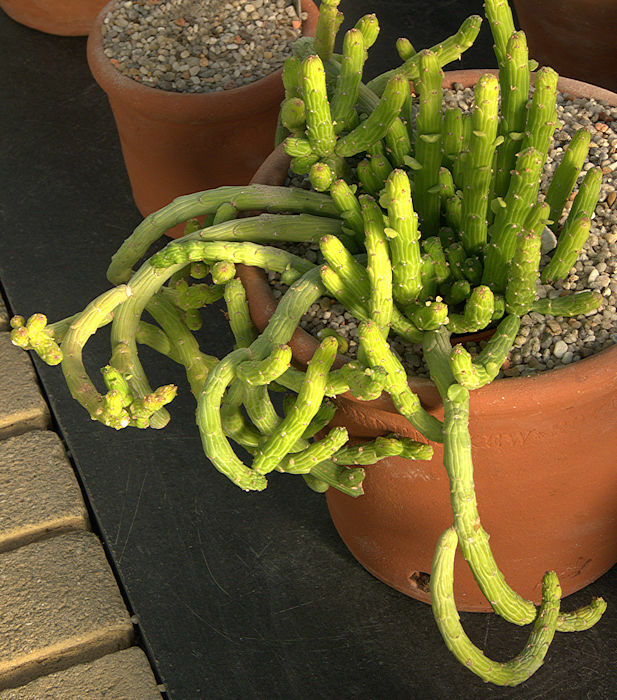 Euphorbia pillansii has columnar succulent stems up to 12 in long with 7 - 9 ribs, clumping up at the base to form shrublets. The surface of the stem is lightly marked with bands of light and darker green. Cluster of small, yellow cyathia are produced in Spring around the ends of the stems. Their persistent, often forked peduncles serve the function of spines. Native to the Western Cape Province. a spiny columnar succulent plant to 18 in tall, clumping from the base. The stems may have up to 20 ribs with spines (old flower stems) along the ribs. The degree of spination and body colour varies. Small purple flowers with yellow stamens are produced along the ribs near the growing point. Native to the Eastern Cape of South Africa. Selected cultivars have no or minimal spines and a glaucous grey body (E. polygona 'Ghost', 'Snowflake'). This Euphorbia is a host for the parasitic mistletoe Viscum minimum. These succulent shrubs grow up to 2ft tall. The sparsely branching angular stems produce a few alternate deciduous leaves near to the growing points and clusters of light-green cyathia tinged with pink during the early Winter. Native to Mexico. Said to tolerate light frosts. One of the "caput medusa" Euphorbias from the Western and Eastern Cape of South Africa. 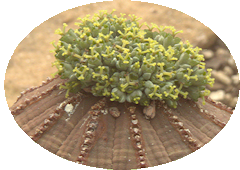 The globose succulent body is surrounded by many tuberculate arms. Each tubercle produces one vestigial leaf. Cristate forms are known and are propagated from cuttings and grafts. The sap is an irritant and a violent emetic. A 15ft tree with brightly coloured bracts (modified leaves) around the small flowers at the stem tips. Native to deciduous tropical forests of Mexico and Central America along the Pacific coast. 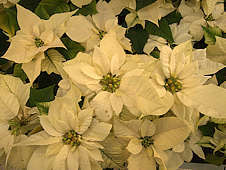 The non-succulent Poinsettia is included here for completeness, as it is perhaps the most widely known Euphorbia. 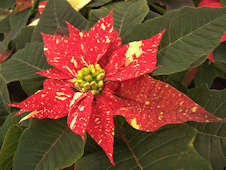 Vast numbers of pot-sized leafy cuttings with brightly coloured bracts are distributed through the horticultural trade, especially around Christmas. Numerous cultivars are available with different colours of bracts and leaves. Poinsettias dislike cold and over-watering, but otherwise there is no problem with growing them on. Bracts appear in response to strict short day lengths of less than ten hours for ten weeks, are usually induced artificially under controlled lighting and are quite difficult to reproduce under domestic conditions. Development of bracts is very sensitive to, and inhibited by incidental illumination at night during this time. 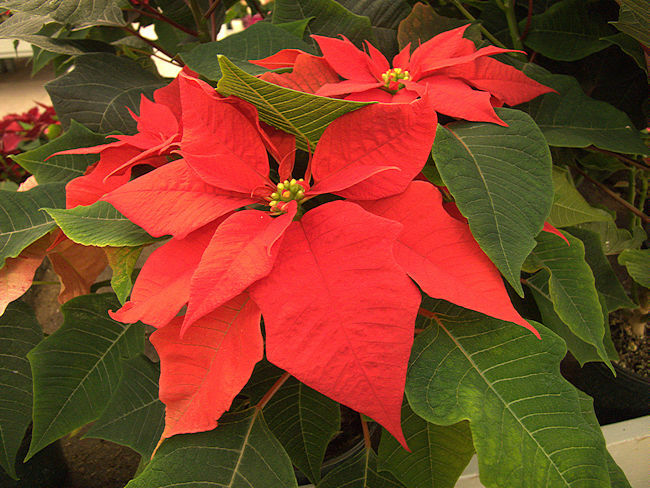 Compared to other Euphorbias the sap of Poinsettias is only mildly toxic, but may still cause irritation. Contact with eyes or ingestion should be avoided. is the succulent spurge of antiquity, known to the Greek physician Dioscorides (40-90 AD) and Pliny the Elder (23-79 AD) for its purgative sap (euphorbium). 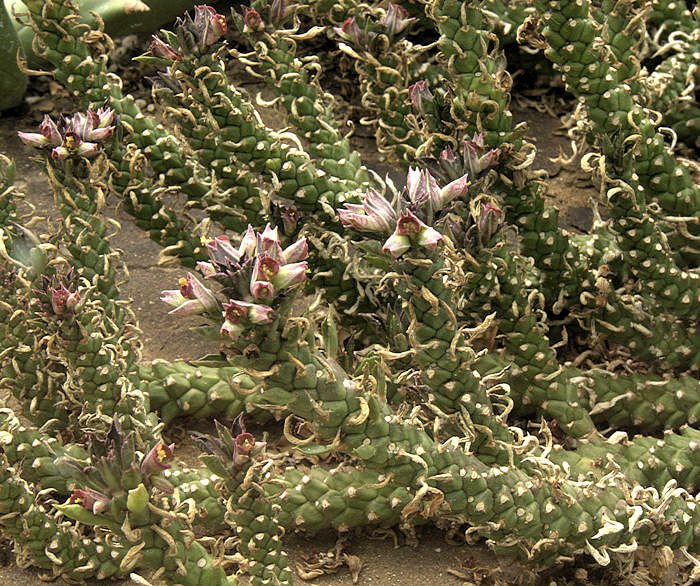 This is probably the thorny plant from Mount Atlas in Morocco recorded by King Juba II of Mauretania (ca. 50 BC- 19 AD). 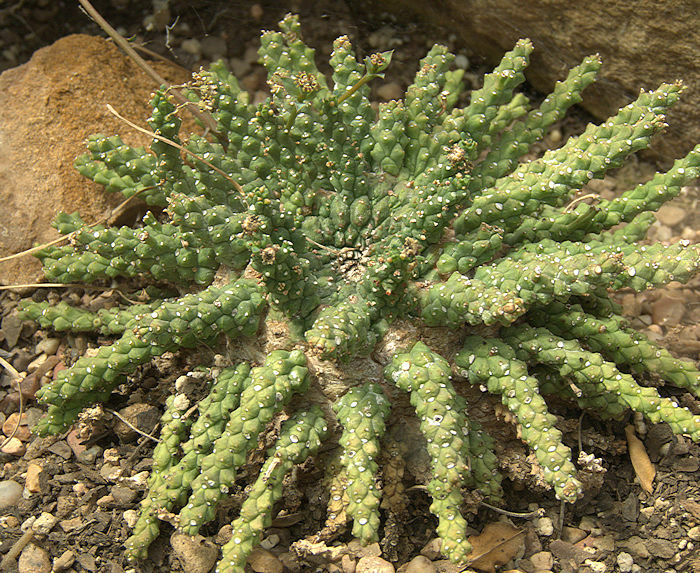 The King is said to have named the plant "Euphorbea", after his rotund Greek physician, Euphorbus. The name was later formalised by Linnaeus (Species Plantarum, 1753) as the official botanical name for the genus. 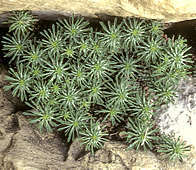 Euphorbia resinifera forms multi-stemmed mounds of four-angled succulent stems, whose edges are furnished with short pairs of brown spines spaced about half an inch apart. 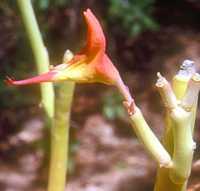 The ends of the stems produce bright yellow flowers along their edges. 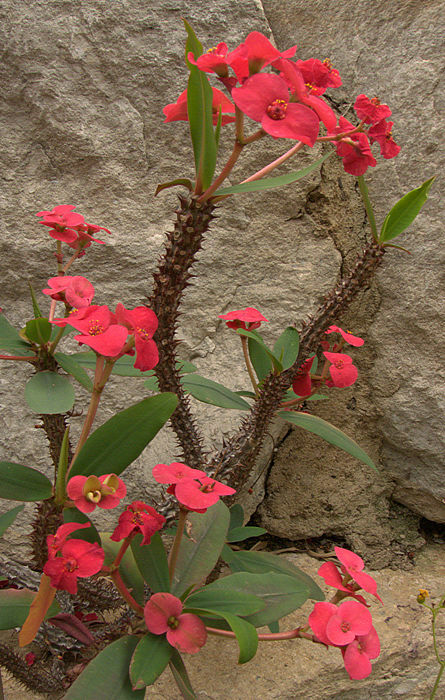 Euphorbia resinifera is easily grown in a Mediterranean climate but may become a noxious weed in some places. It is readily propagated from cuttings. All parts are toxic, but the resin (dried sap) has been used as an extreme purgative and wood preservative. 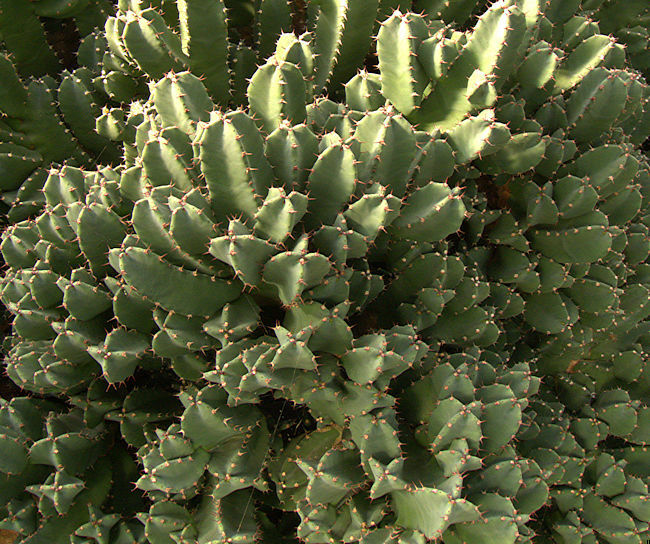 This succulent Euphorbia has 4 - 5 angled stems with slightly concave sides,branching at its base to form a shrub upto 6ft tall. The margins are undulate with closely spaced pairs of spines and nearly confluent spine shields forming a horny edge. The small ovate leaves are vestigal. Brownish flowers are produced above the spines near to the stem ends. Native to tropical East Africa including Mozambique and Uganda. 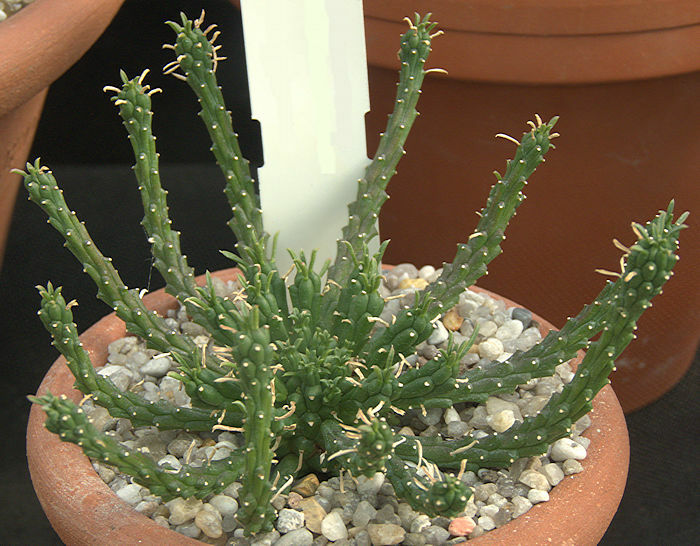 a choice small caput-medusa style Euphorbia from the Karoo, makes a handsome specimen given sufficient time. 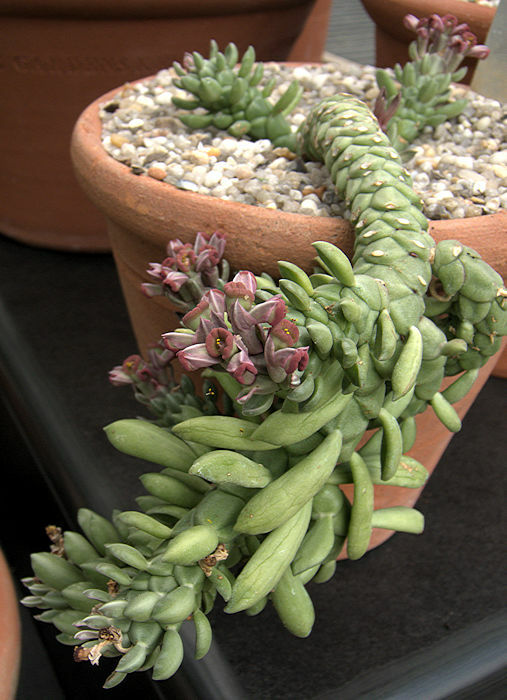 This succulent plant developed a cristate main head although it grew normally for many years. In their habitat, the plants are sunk into the ground with the space between the main head and the side stems covered in grit or debris. However, plants in cultivation need to be raised to keep them healthy. This one is grown in diffuse sunlight behind other shrubby spurges. 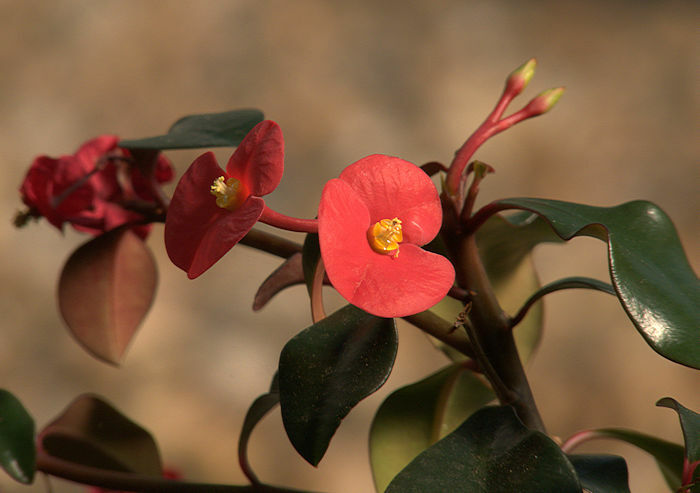 Euphorbia suzanne tolerates a cool, frost-free winter provides it is kept dry. It should be planted in a very gritty mixture with plenty of crocking at the bottom of the pot. Water sparingly, especially when dormant. Photo: M. Fields 2010, at J. Paul Getty Museum, Los Angeles. 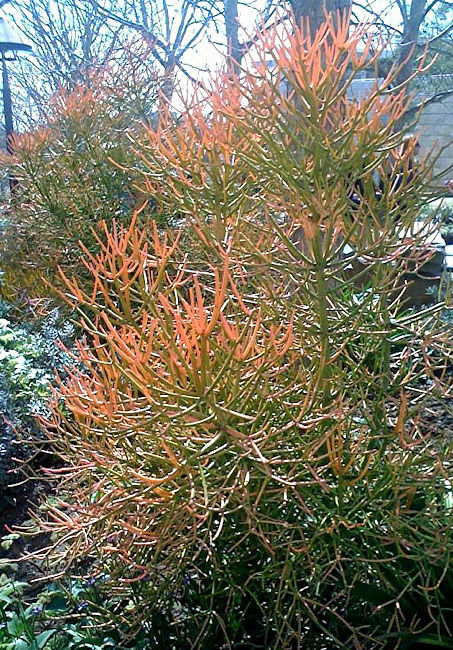 possibly the "Sticks on Fire" cultivar from the Huntingdon Botanic Garden. Another selected cultivar "Firesticks" colours up to an even brighter red, making a fine display of colour. 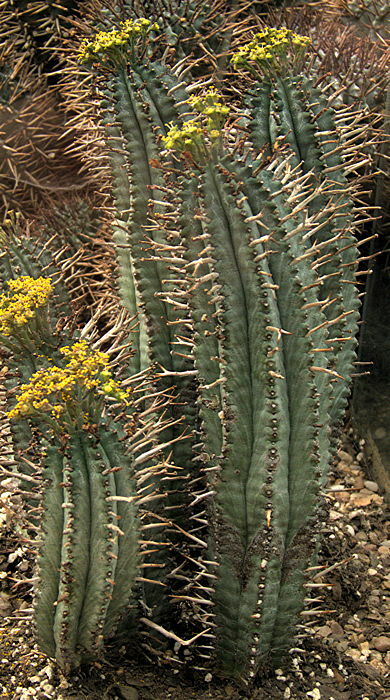 Euphorbia tirucalli grows with one or more woody grey-brown trunks up to 30 ft tall, supporting brush-like masses of green succulent cylindrical branches about as thick as a pencil. Vestigial leaves are tiny and rapidly shed. The tiny yellow flowers are clustered on the branch tips. 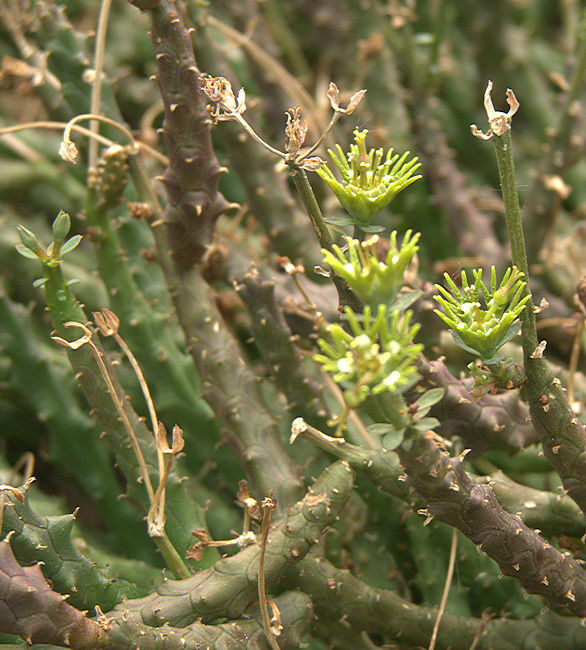 Euphorbia tirucalli is widely distributed on poor and salty soils, from North-Eastern to Southern Africa and Arabia. It has been naturalised in many tropical countries including India. It will not stand any degree of frost. 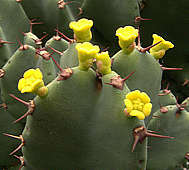 The milky sap of many succulent Euphorbias is often an irritant, but that of Euphorbia tirucalli is notably corrosive. I am surprised that it is so frequently offered for sale without warnings. Contact with skin may cause burning pain and irritation. Contact with the eyes may cause temporary or permanent blindness. If contamination of the eyes occurs, flush them with water for several tens of minutes and summon medical assistance. Swallowing the sap is potentially fatal. 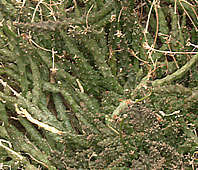 Euphorbia tirucalli is used as an impenetrable hedge or livestock enclosure. Fishermen put macerated branches into streams, where the sap stuns the fish making them easy to catch. The sap can be converted to an oil substitute. Cultivation of this plant on otherwise useless land has been proposed as a sustainable source of energy. The plant is also widely used in traditional medicines as a cure for sexual impotence, an antidote for snakebite and to cauterise skin lesions and tumours. 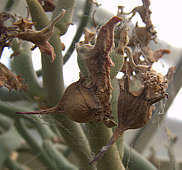 A succulent shrub or tree with large fleshy leaves, growing up to 30ft tall. Umbels of red cyathia are produced at the ends of the stems. Native to tropical East Africa, including Malawi, Mozambique, West Kenya and Uganda and naturalized in many tropical and subtropical countries. Cultivated for the large decorative leaves and as a hedge. This clumping, shrubby succulent plant has a central 4-8 angled stem that often spirals, supporting several leafless branches which usually don't spiral. Regular constrictions in the stems give the plant a scalloped appearance. 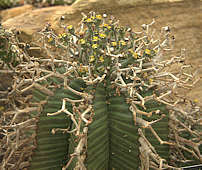 The edges of the stems are furnished with pairs of thorns, seaparated by a single cyathium scar. Small, bright yellow flowers are produced near to the ends of the stems. Distributed from the Orange River in South Africa, through Namibia into Angola. The carcinogenic milky sap is very poisonous and traditionally used in arrow poisons. Despite this, it is an important source of food for the black rhino. This species is a host for the root parasite Hydnora africana. 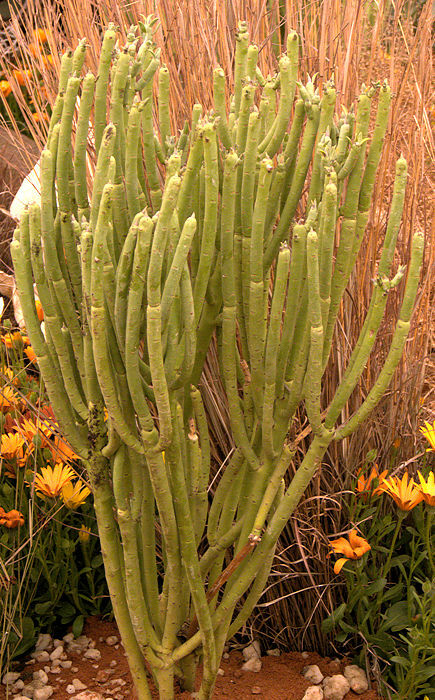 A low-growing succulent plant whose tuberous root produces masses of tuberculate stems, spreading by stolons. Note cristate portion. Native to Namibia and the Northern Cape. 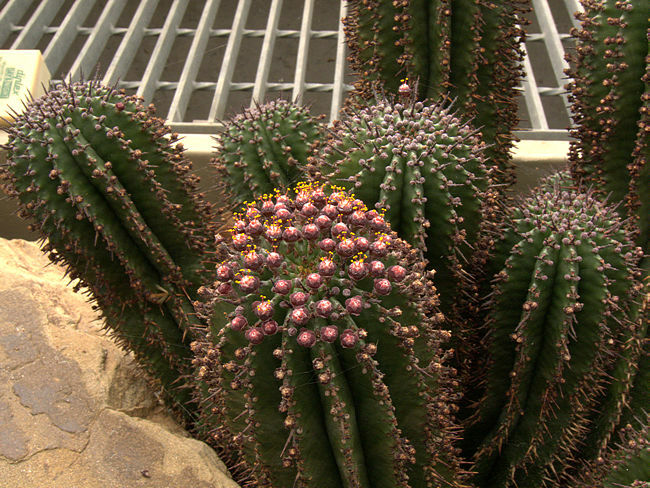 This diverse genus includes around 175 succulent plants and woody shrubs and trees from both Africa and the Americas. Several species have fleshy roots or thickened or caudiciform stems. As with other Euphorbiaceae, members of this genus should be regarded as toxic. Some species contain phorbol esters that promote cancer in conjunction with a second agent such as sunlight. 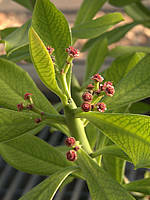 Jatropha podagrica is commonly sold in the horticultural trade as a tender caudiciform houseplant. Jatropha integerrima (Spicy Jatropha) and Jatropha multifida (Coral Bush) are used as ornamental shrubs in frost-free climates. Jatropha curcas (Physic Nut) is a small (15 ft) tropical tree whose nuts have medicinal value or are eaten after roasting. However, the nuts are also a common cause of poisoning. 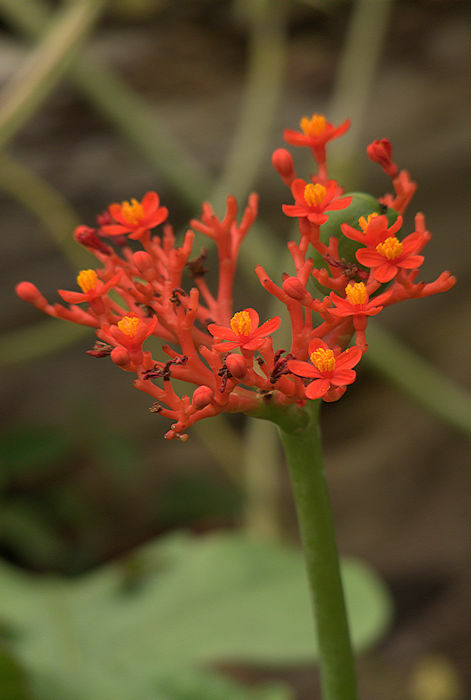 Jatropha curcas is widely cultivated for its oily seeds, a source of biofuel which may even be suitable for aviation. The nuts also yield a purple dye. Jatropha gossypifolia is regarded as an invasive plant, toxic to livestock. Manihot esculenta (Cassava), the starchy tubers of which are an important food, was formerly in this genus. These xerophytic low succulent shrubs are growing on limestone South of Shafter, Texas. Roots are orange rhizomes, spreading by stolons to form colonies a few feet in diameter. 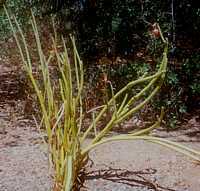 The infrequently-branching, rubbery stems bear clusters of narrow leaves on short spurs. When damaged, the stems exude a clear sap, turning blood-red and which has been used as a red dye. The quarter-inch flowers are pale pink bells clustered at the ends of the stems. Very tolerant of heat and moderate frost. Native to Texas into Mexico, as far South as Oaxaca. Name: Greek podagrikos = liable to gout, referring to the swollen stem. This tender caudiciform has a basally-swollen stem, up to 5 ft tall and 8 in diameter, marked with leaf scars and peeling bark and crowned with several waxy, 3 - 5 lobed peltate leaves. The bright orange-red panicles of flowers are very attractive to butterflies and are self fertile. Flowers are folllowed by green pea-sized pods which when mature burst explosively to scatter their seeds. Tie muslin gauze over the pods if you want to save the seeds. Native to tropical central America (Guatemala - Panama) and needs constant warmth to thrive. The horticultural trade produces large numbers of Jatropha podagrica, although they are not easy house-plants, particularly disliking over-watering. All parts, especially the seeds, contain a toxic lectin, curcin and must not be consumed. Name: Gr: mono = one + Gr: aden = gland - for the horseshoe-shaped nectary gland. A genus including 73 species of geophytic herbs, shrubs and small trees with caustic latex sap, mostly native to tropical East Africa, including Angola, Mozambique, Somalia and Ethiopia into South Africa. 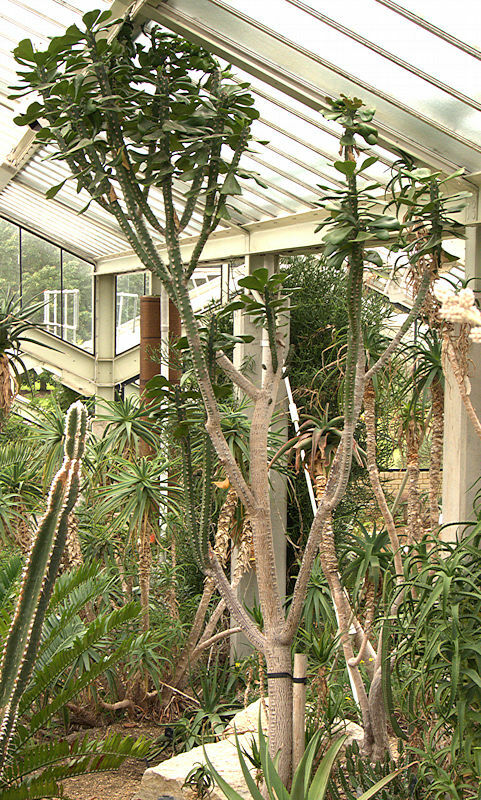 These tropical plants need constant warmth to grow well. As a result of DNA studies, all Monadenium species have been moved into the genus Euphorbia despite their distinctive hooded flowers, thought to reflect convergent evolution. However, this still appears to be a useful grouping. Their new names are included below. 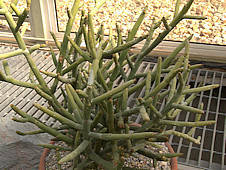 A substantial caudex up to 6 in diameter produces green angular stems up to 4ft long occasionally branching after damage, with small opposite oval leaves. Distinctive red flowers are produced near the growing point. 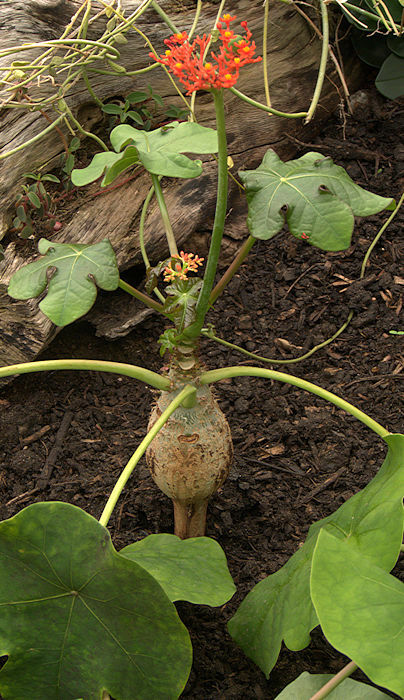 A stout tuberous root supports succulent green stems with elongated-ovate leaves and small cream-coloured flowers. Native to Tanzania. The root is often raised for display as a caudiciform. Named for: Dr. Hans Ellenbeck. 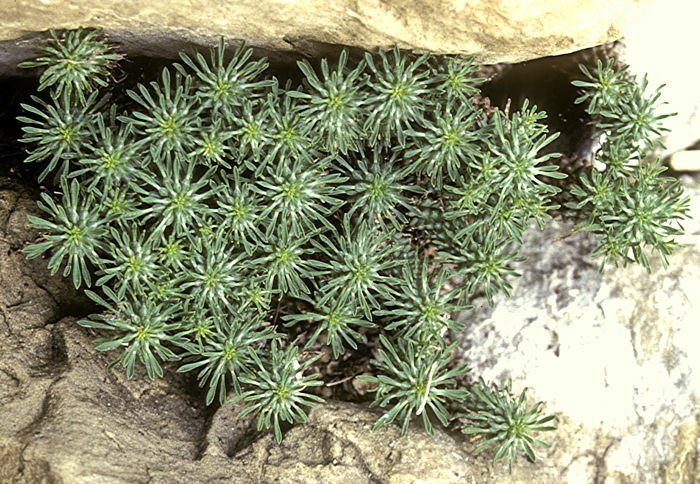 A fleshy rhyzome produces a cluster of grooved, fleshy yellowish-green serpentine stems with small vestigial leaves and tubercles. Small greenish-yellow cyathia are produced near to the ends of the stems. Native to Ethiopia, Kenya and Somalia. 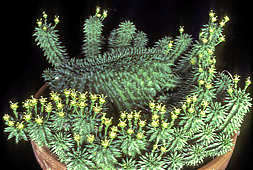 The succulent green stems are patterned with marked tubercles from which vestigial leaves are produced. Native to Tanzania where it grows on rocky slopes at elevations of up to 3000 ft. 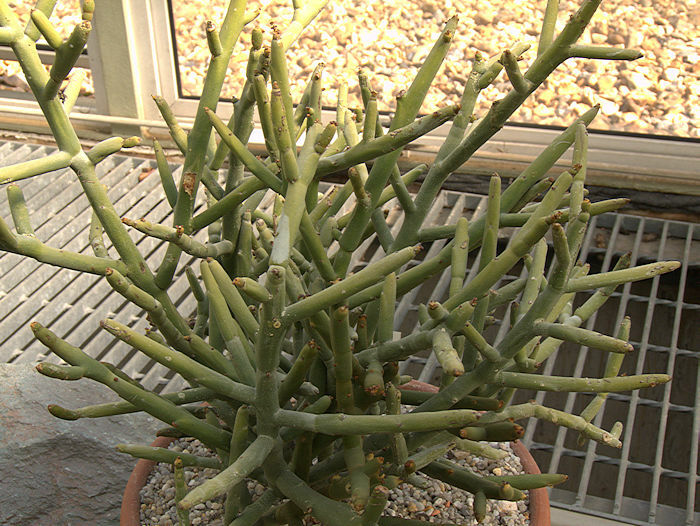 This species has fleshy roots producing multiple succulent stems above ground. 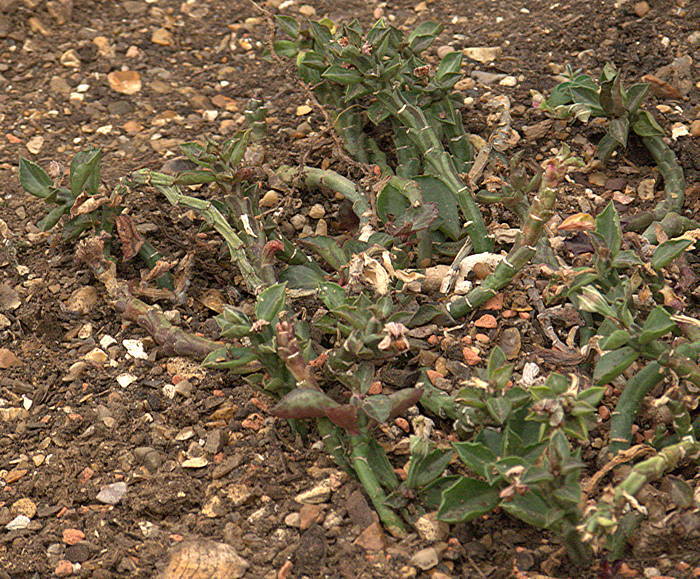 The ends of the stems produce small leaves with purple markings. 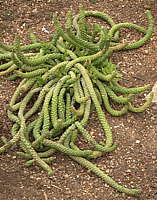 This succulent plant has tuberous roots and fleshy tuberculate stems, branching from the base or by suckering. Tubercles have very small spines at their apex and near their growing point, fleshy, light-green deciduous leaves. In the Summer, flowers with bright pink cyathias are produced at the apex of stems. 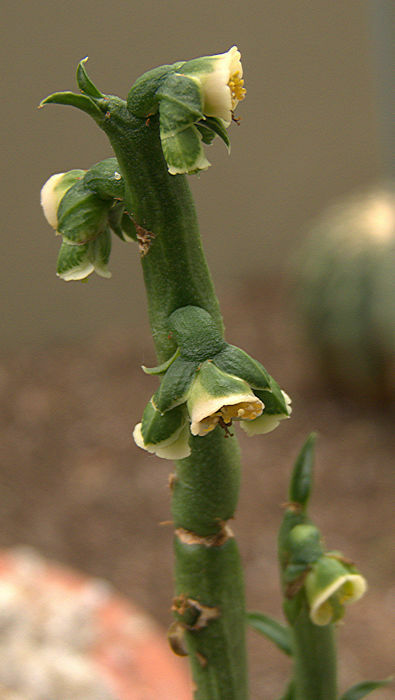 A perennial stem succulent, with deciduous obovate leaves near to the ends of the upright tuberculate stems and white flowers around their tips. Native to Tanzania where it grows in deciduous forests at elevations of up to 5000 ft. As a forest-dweller it prefers bright light but not full sunlight. This form has flowers with pink edges.The stems may become tinged with purple in very strong light. Native to Tanzania. A similar cultivar is sometimes marketed as Monadenium 'Tanzania'. 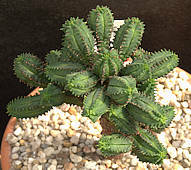 This succulent Euphorbia has sprawling stems patterned with shield-shaped tubercles, each with a leaf scar at its tip. Deciduous fleshy lanceolate leaves are produced near the tip of an actively growing stem and are accompanied by brownish flowers in late Summer. 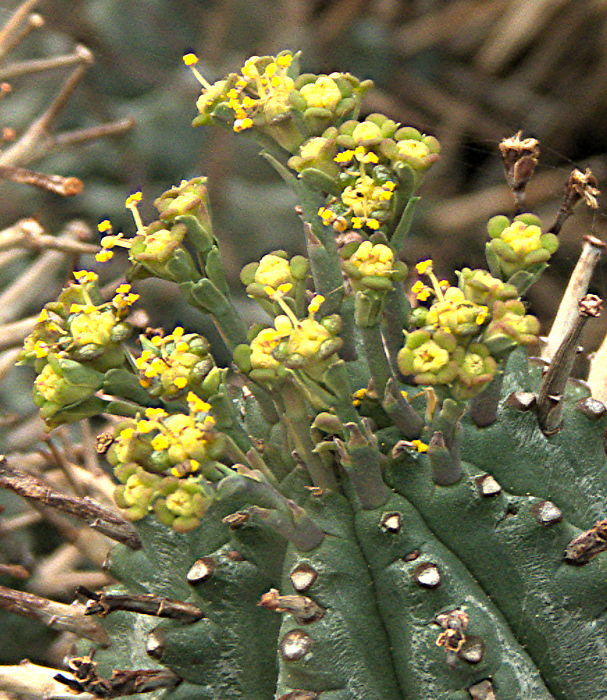 Native to Kenya, Tanzania and Uganda, growing at elevations of up to 6070 ft.
A genus of around 15 species of shrubby succulent plants related to Euphorbia, from the Americas including Mexico and the West Indies. 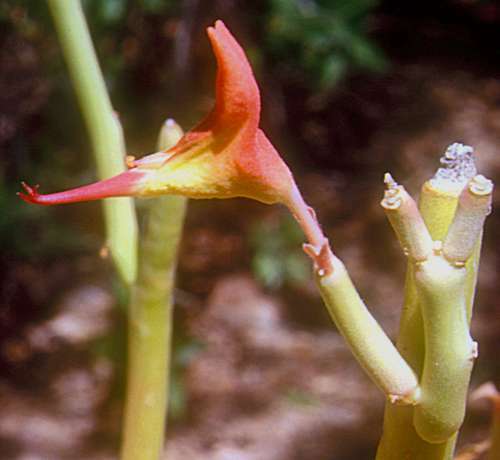 Flowers have characteristic shoe-shaped bracts, often red or orange and pollination is often by humming birds. The fruits are dehiscent three-lobed capsules. 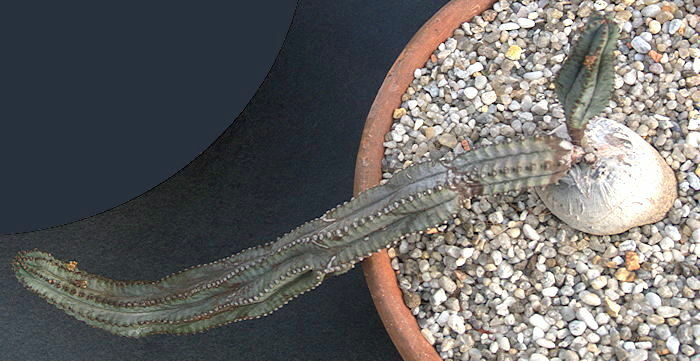 Steinman (2003) reduced Pedilanthus to a synonym of Euphorbia, based on analyisis of DNA sequence data. from Sonora and Baja California, growing in the Phoenix Desert Botanical Garden. The flowers attract humming birds. This species is an excellent ornamental succulent plant for a container in a warm climate but will not stand any frost. Right: Cristate P. macrocarpus stem at RBG Kew. is a tender climbing succulent shrub native to Florida and the West Indies to Venezuela, but established as an invasive weed throughout the tropics. 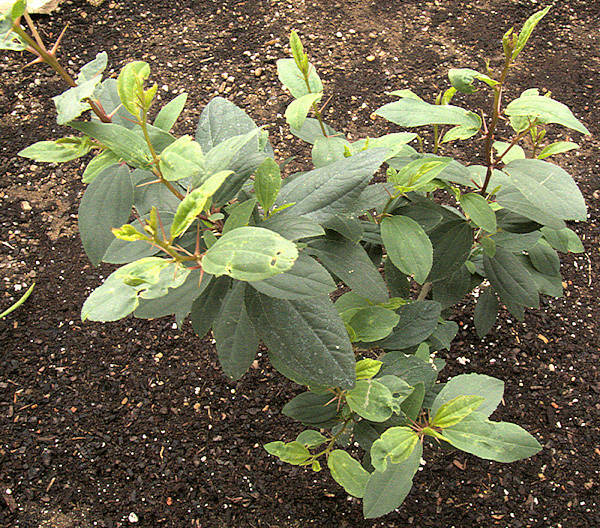 Young stems carry pointed oval leaves. Often cultivated as a tender ornamental plant. This species grows profusely on poor land and is of interest as a potential biofuel crop. Right: Pedilanthus seed pods. The seeds have been caught by spider webbing.